My love affair with The Printful started in May 2015. As a small shop owner who became overwhelmed with hand printing, packing and shipping shirts each month from my online store, I needed help. A LOT of help. At the time, we easily processed more than 500+ order each month. So when I first became aware of the t-shirt fulfillment services The Printful offers, I thought they’d be my knight in shining armor that would rescue me from a slow demise. The Printful is a great option for those starting out and want a “low” cost and quick setup of an apparel and accessory brand. Just be careful. Their service isn’t for everyone and I’ll tell you why. Since I really love the concept of their service, I’ll start with the pros. 1. Quick setup. When I migrated from hand printing products to The Printful, I had a little over 70+ designs t-shirts. I took my store offline for 3-5 days and was able to upload and configure all of my designs and relaunch my shop. 2. User interface. For people that work better when websites are clean, organized and function well, you’ll be happy with The Printful UI (user interface). It’s easy to navigate and find the information you need with a few clicks. 3. Variety of products. If you’ve just decided to dip your toes into selling t-shirts you’ll quickly figure out that it doesn’t take much more effort to add additional products to your shop. The Printful offers mugs (11oz and 15oz), hats, posters, totes, all over sublimation printing, and pillows. I only wish they would add phone cases. 4. Noticeable improvements. The Printful team makes updates constantly to improve their offering. It’s comforting to know that the company invests in making their service better. 5. Helpful staff. Each time we’ve had trouble with an order it was resolved fairly quickly. Once you’re established, you’ll be communicating with the same people frequently. Keep their direct emails, as it will be quicker to get issues resolved in the future. 6. Template generator. OMG. This was a lifesaver! The Printful product mock generator saved me hours of time. I can’t tell you how I dreaded having to crank up PhotoShop and dig into my various templates to create realistic looks mocks for my store. This feature is the main reason I’ll still visit the site, even after moving on to a new process. 7. Seamless integration. Setup with my Shopify store took minutes. The Printful integrated with all the major players in the e-commerce business, WooComerce, BigCommerce, Gumroad, Storenvy and more. I can’t wait until they have the Etsy and SquareSpace integration up and running. Currently, there is a workaround for stores using those platforms via ShipStation. 8. Informative blog articles. Next to the Shopify blog, The Printful’s blog is one of my favorites. 9. Payment options. I loved that orders didn’t have to be immediately processed and you weren’t required to keep a credit card on file. To make sure I was aware of what is being spent and ordered, I used the wallet option. With this feature, I’d load my account weekly with funds to process orders, then manually fulfill each order. This made more sense for me and allowed time for customers to make changes to their order before they were processed. 1. Price. Yes, this is a pro and a con. For a start-up, the costs are fair, but in terms of actual profit, the cost is high. An American Apparel shirt base price with design can range from $14-16. If you retail your shirts at a minimum of $26, you’d earn a profit of at least $10 per item. 2. Quality. The quality of the 100% cotton shirts was fine. I’ve found that the shirts requiring white ink were the best. Shirts that had dark color inks looked the most faded and cheap. The worst printed products I’ve found were the tri-blend tees. These had the poorest quality and I received plenty of complaints. 3. Variety of products. They have a wide variety of products, but some categories were a bit lacking – like their options for sweatshirts and t-shirts for women. The colors they carried were good, but specific colors would often be out of stock. 4. Timeliness. The time it took to print and ship products always varied. Honestly, printing and shipping products took anywhere from 7-10 business days or longer during growth spurts. Most customers are understanding if you make the estimated shipping time known before they place an order. 5. Shipping costs. The shipping is way too high. Example (at the time of posting) The Printful charges $6.50 to ship one mug, but if a customer buys one mug and one shirt, they are charged an additional $2-4. This is not ideal because in reality, both products fit in the box used to ship the mug. A customer should not have to pay $10 to ship two items. 6. Order errors. One of the reasons I went with The Printful was to reduce the amount of errors with orders. That didn’t happen. Once a customer actually received an order from a different shop entirely. Luckily, their support staff has always been helpful with getting these errors resolved. 7. Template generator. Yes, another pro and con. The template generator is great, but it does not have all of the styles that are available on the backend. I usually fudged the graphics in order to reflect the design I wanted to create. 8. Managing orders. The backend is simple and easy to navigate. I only have two issues. First, the process by which you add new products seemed unnecessarily redundant. You have to configure each item individually which is time-consuming. However, once you’re done, there is no need to revisit that section unless you have to make a change. My second issue is the main dashboard. The organization of orders wasn’t great. You have to scroll through too many pages to view older orders. It would also be nice to segment orders based on Needs Approval and Not Synced. Once you get started these suggestions will make more sense. 9. No refunds. The Printful does not offer refunds unless orders have been lost or there was an issue with the actual item (damaged or wrong item). So you must relay this to your customer so they order the right size and items before they purchase. Any reshipments due to customer error will cost you. 10. Out of stock. This is one of the most frustrating issues. There was no way to tell which items were out of stock before an order has been placed and started processing. You don’t even get a notification via email. They flag orders within the dashboard and it’s up to you to choose another item. Emailing a customer who’s already waited 4-5 days for an item to print and tell them it’s out of stock, is not how you conduct business. 11. Shipping replacements. If a wrong or damaged order is sent, The Printful is more than happy to get it resolved. There’s just one problem. It can take up to two weeks for orders to be reshipped. Let’s think about this. That’s two weeks for the original order to ship. Then an additional two weeks to ship a replacement if the product is damaged. A total of 4 weeks for one order. Customers will be mad. Don’t say I didn’t warn you. 12. Expedited shipping. If you contact a rep or support person they will say they have the ability to expedite orders. Let’s face it, not everyone can wait two weeks for an order to arrive. The Printful offers expedited options, but the process doesn’t work well. You can allow customers to pay for next day shipping, but that doesn’t allow for the time needed for the product to be printed. So it’s not a true next day shipping option as your product still won’t ship for a few days. Do yourself a favor, don’t add that option to your shop. 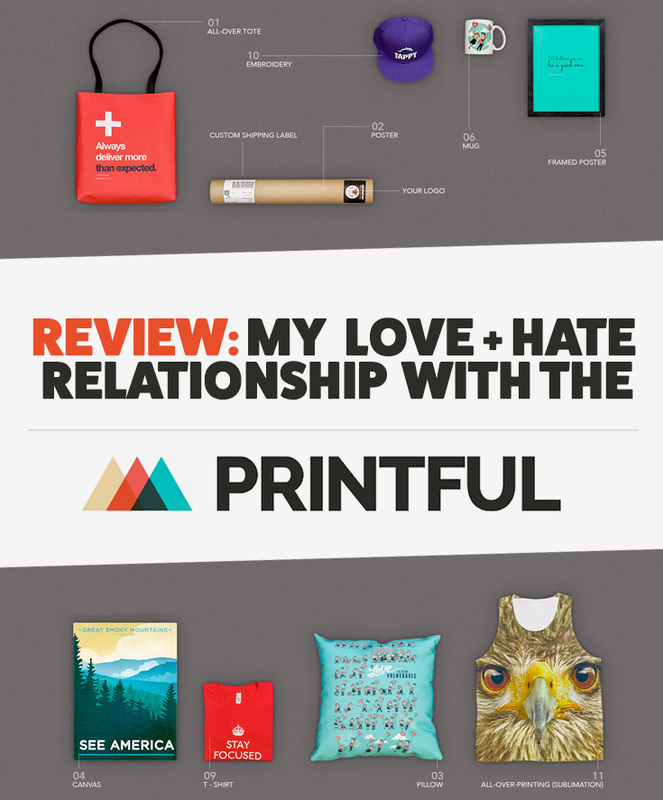 If you’re looking to launch a brand selling t-shirts, mugs, posters or hats, but don’t have much time or money to get started, The Printful is an excellent option. You can set up a shop and go from 0-100 in less than 24 hours. It’s great if you want to try a new concept and need monetary proof it can be profitable with no upfront costs. If you want to build a solid brand with impeccable quality, where you have full control of products, pricing, and shipping, you will have to consider other options. This is especially true if you are thinking about wholesaling a product and attracting larger retailers (some of which can include screen printing by hand, heat press transfers or wholesale screen printed product locally). Note: Just beware. Choosing The Printful as your product fulfillment center means you are 100% responsible for customer service. You will need a dedicated email address set up where customers can reach you when they have questions about an order. I recommend a customer service app like HelpScout. Current Status: After about 3 months of using The Printful I went back to printing, packing and shipping my own products. I needed control over quality, shipping, timeliness, and income earned. For the cost, using The Printful just wasn’t profitable for us and the future of our business. Have you used The Printful? If so, what are your experiences?